Glendalough Arts Network and the Brockagh Centre are delighted to invite Tom Quinn of Tribal Spirit to Laragh for a series of fun and therapeutic Workshops, starting on Monday 15th of October, 7 – 8pm with a FREE Introductory Night. 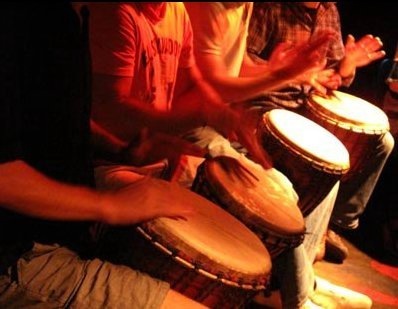 The main drumming workshops will begin on Tuesday October 23rd, 7 – 8:30 in the centre. This drum circle invites people to come together to celebrate community and life through rhythm and music. We use African drums such as djembe, boogeraboo, djun dujns and other instruments such as bells and shakers. We learn celebratory and healing rhythms and chants from the tribal cultures of planet earth. We work as a group to create the rhythms. Everyone has something to offer within a drum circle.